So, what are the benefits of working with a personal trainer as opposed to just working out at the gym? “The main benefit is that a personal trainer will take your workouts to the next level by devising a personalised programme for you that is specifically tailored towards your unique goals and capabilities,” says Kevin. “But they will also make sure that you get every element of that unique programme right, by offering constant instruction and guidance to ensure that every minute you put into your workouts is maximised to getting the results you want. “The most important thing is to meet the trainer as soon as possible,” says Kevin, “as you’ll be relying on them to motivate and drive you on to achieving your fitness goals. It’s important that they have the right personality for you and that it’s someone who you can forge the required relationship with. 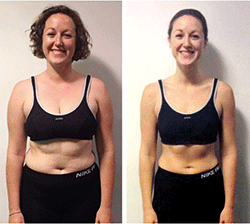 Rose, a 31-year-old London operations director, lost 27lbs and almost halved her body fat after 16 weeks of working with a personal trainer. Rose had struggled with her weight for years and this was causing her great unhappiness. She decided to take definitive action by signing up to a personal training programme with Ultimate Performance. Rose admits she initially felt “terrified”, but soon found herself enjoying the training.